Perhaps similar to many Deadheads, I spend the bulk of my listening time on shows from the 70’s and 80’s. I get back to the 60’s less frequently, and whenever I do, it strikes me that the shows from that decade are made up more purely of the essential power that would slowly diffuse into all the years that follow. It’s like standing close to the furnace within a power plant that, in turn, powers an entire city. This close, the source itself overpowers anything else, demands your attention. It’s at once frightening and unbelievably awesome at the same time. Put another way, the 60’s were the Grateful Dead’s big bang, and the resulting years were the slow expansion and formation of a glorious universe born out of that supremely powerful moment. 60’s Grateful Dead shows tend to have the opposite problem to that found in the 80’s, but it leads to the same challenge. In the 60’s, there were virtually no subpar shows. And while it means you can stick your hand in the jar and almost always come out with a tasty bit of candy, knowing which piece to grab first can still be a struggle. Picking 60’s shows for the blog has been my greatest challenge thus far for just these reasons. August 1968. Always known as an amazing time of an amazing year. This entire show is, without a doubt, a knockout. So much good stuff all over. But what happens from Alligator on is beyond imagination. It takes the date to another level, leaving everything played before it somehow only "great." The Other One blazes with that white-hot freight train intensity that typifies 1968 Dead. But as the show moves along, the true colors of this period begin to seep out from cracks in the skin of the flames. Dark Star is pushing ever closer to its destination of late February 1969. 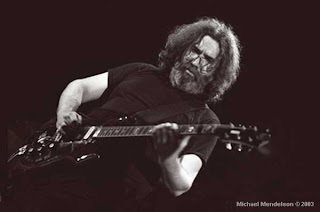 There is a wonderfully gooey passage where Jerry rides his volume knob up and down. Throughout the song you can hear many of the themes that would become rock-solid threads in the fabric of Dark Stars to come. They move into "St. Stephen," and it is most notable for the absence of crowd eruption that its first two notes would elicit in the years to come. It's neat to ponder the youth of the song here in August 1968. This is one of the first ten performances of that tune. The Eleven is a tidal wave of power. Phil's ability to crunch out note after note, pile-driving energy into your spine, is colossal. The song spins wagon wheels of music slowly over each other. Knots are being tied and untied. Threads ignite and burn like wicks rushing toward dynamite. The drummers begin to snake into one another while Jerry starts to find small themes that pull him out and over the scene. Seconds before the tape cut, it becomes clear that Death Don't Have No Mercy is coming next. Nonetheless, the cut strikes like a city-wide power outage. Though the hint of Death Don't is there, the final decent out of The Eleven is lost. The only saving grace is that none of Death Don't itself is really missing. The tape picks back up at what seems like the logical start of the song. Soulful darkness pervades Death Don't Have No Mercy as usual. 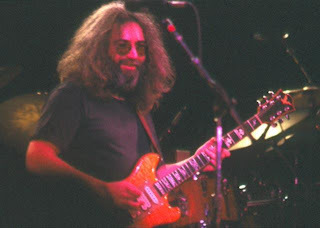 There is a great bonding tie-in when Jerry again rides the volume knob in the same sticky liquid waves he found in Dark Star. It comes in the verse after his solo and it's very brief. But it's this sort of thing that makes the song all the better. A twisted image crowds my mind at the start of Alligator. I can't shake the vision of Pigpen telling his story in the song to a group of boys and girls in the kids' section of the local library on a Saturday afternoon. It's odd, and in the first moments of the Drums that comes after his last lines it is swept away. The drummers reach directly into their tribal revival rhythms, joined a few minutes later by Jerry. In a few more minutes the entire band is crashing back into the Alligator jam. It is most pronounced by its lyrical quality. Jerry soars over wildly joyful lines that continually toy with the Mountain Jam. This lends a perfect color to the white-hot blaze of energy - warm yellow and green washing into an electric sea of light. Jerry is breaking the membrane that holds the band on the ground. Without pausing for breath, they bound into Caution. The tide rises and dark blue-black water churns from depths untouched by sunlight. A mild feedback courses over the drums revealing for a moment the true source of the black waters far out above the stars. Pigpen gives the verse, and the call/response between band mates of "all you need" is nicely delivered and heightened by the strong panning of each voice in the stereo mix. This is followed by a dive into Feedback. The sky is peeled back to reveal a home in the back-lit canopy of stars and moons. Music dissolves into cosmic voice and song. The comfort of this space is undeniable. Objects pass around you fast and slow, strange yet familiar. It's as if in Feedback the band manages, with its combined effort, to strum some inner instrument that runs its strings though each of our bodies. It flashes brighter, then is formed into more lyrical bliss by Jerry for a minute or so, the band roaring and moaning beneath him. Caution comes back out of the dark and charges ahead like a beast unchained. But the drone of the inner instrument proves too strong. It pours back into the foreground like sheeting rain pushed on the wind. Somehow, order finds a foothold again in Caution-like sounds. This back and forth between Feedback and Caution is amazing; so much explained in a place so confusing. Then, as if mildly amused by the attempts of order being placed on it, the inner instrument washes everything off the table and leaves the endless void of true space in its wake. Shimmering lights and pulsating globes consume all. When the reality of the Shrine Auditorium returns with the clapping of hands, it is the most pathetic of attempts at trickery. Surely we have just been snatched out of true reality back into the dreams of daily life - the glimpse of the real world receding on feathered memories that cannot be forgotten. Absolutely one of the best audience recordings you could ask for, Rango Keshavan’s recording from The Greek Theatre on May 13, 1983 is nearly flawless. 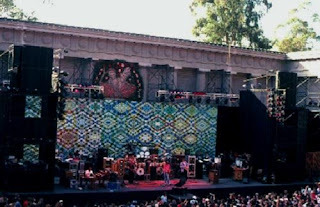 If you want to get a feel for what it was like to sit in the absolute sweet spot of the Greek for an incredible Dead show in the early 80’s, this tape will perform perfectly. There’s something about this show that defies the standard trappings of 1983 Dead. Generally, when I think about 1983, I think about amped up versions of great Dead songs that often find their way into deeply explorative corridors and side roads. This show manages to deeply satisfy, but not for the reasons an early 80’s show typically would. As you’ll see in the review, I’m most taken by how at ease the band seems – how often they seem only in it for themselves. This quality is not all that common to my ear in '83, and here on 05/13, it renders something very special indeed. The show sets itself on a shelf all its own. Always nice to get an opening Cold Rain & Snow, set one is solid and includes the debut of Hell In A Bucket. Bird Song provides an assured escape from the ordinary, as it always could. Jerry’s solo finding lovely heights over slowly churning waves. The Let It Grow set closer also finds ways to explore its outer reaches over intense bass and drums work. The band really starts flying late in the solo, where everyone starts letting all the seams loose. The music flashes and flares, reaching a wonderful peak with Jerry stepping above everything while a sea of chaos turns beneath him. China Cat Sunflower starts off the second set, but it is clear that Bobby is absent. The rest of the band continues to stretch out the standard opening passage while Bob takes care of whatever is keeping him from joining in with his signature China Cat lick. 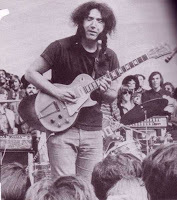 Eventually, Jerry launches himself into Bobby’s line high on the neck at just about the same moment that Weir gets things straightened out. The crowd cheers, as Bobby and Jerry play Bob’s line together for a moment. The song hits the first verse, high on the extra energy brought on by the unconventional start. Through the solo section before they make it into I Know You Rider proper, the music takes on a carnival/calliope element. There are more colors, shapes and patterns drifting around than seem possible. This music is oddly bluesy, bluegrassy, cajun, and funky all at once. And as the Rider solos begin to mount, it becomes quickly clear that Jerry is completely dialed in. The solos continually reach what seem like endings, only to spin off for another round of exploration. Jerry’s staccato playing style soars into lyrical geysers of emotion, shaping the brief sharp notes into liquid rivers of sparkling rapids. You can hear the audience getting off around you, the clear indicator that there’s magic going on. China>Rider in 1983 – a thing of beauty. Estimated Prophet picks up from the end of I Know You Rider, and Brent slowly starts working into the long pulsing gossamer strands of tone on his keys that so typify his 1983 sound. 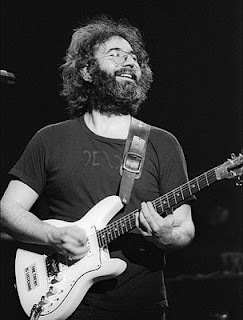 Jerry sounds like a child romping through an open field chasing butterflies and dreams without a care in the world. He’s soloing, but well below the forefront of the music. It’s somewhat like catching a magician practicing his craft while he thinks no one is looking. He’s so at ease, playing only for himself. The entire band is taking center stage here, allowing the tendrils of music to extend out and interweave into brilliant mathematical knots. Eventually, Jerry gets the desire to move things along, and begins drawing attention to himself, and the song ever so slowly begins edging into Eyes Of The World. Eyes gets started with some blissful solos as the band’s energy climbs. We arrive deep within what can only be described as pure Grateful Dead music. It doesn’t speak of 1983. It speaks simply of the Dead. This Eyes is full of all the exuberant joy that can be found in this song time and time again. It’s lean your head back and smile music. The song goes on and on (over 20 minutes), and basks in its own warm glow. There can be no doubt that music and recording quality come together here to elevate the experience entirely. It’s precisely this that exemplifies another facet of the magic Grateful Dead jewel. It’s not something mind crushingly psychedelic. Rather, it is supremely accessible. And it’s not genre music (although there may be little denying that the Eyes two-chord rhythm is sort of sunshine pop-like). It’s something else; something that seems highly personal. When Jerry is soloing here you get the feeling that the band is playing for itself, much as Jerry’s solo work in Estimated sounded earlier. The listener is present almost as an afterthought. It is in the way the music seems more private, less contrived, less pushed, that the defining characteristics fall away. There are no rocketing peaks; no sun exploding notes. It’s not a classic 1983 moment. It isn’t what the early 80’s were all about. It’s more than all of that, and as such, it is pure Dead. I’m struck that this is probably the perfect Dead music to hear streaming out of someone’s car. Working magic at such a deep level, it can easily draw an unsuspecting ear to it, wanting to know what it is, to hear more. 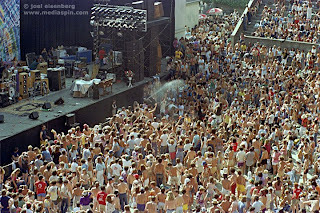 It’s the very music that if heard in the lot before a Dead show, you’d feel compelled to walk over, pull up a seat, and ask the date of what’s playing. It’s exactly the sort of jamming of which you want to hear completely. Since most un-indoctrinated fans would have no reason to appreciate 1983 Dead shows, learning that this Eyes came from 83 would surely illicit a “Wow! Really?” response. Or perhaps that response would come from those who thought they did know what to expect from 1983. This is the kind of Eyes I would bring to a Saturday afternoon Dead Listening party with my friends, holding off on telling anyone what the date was so to prolong and enhance the pleasure when the truth is revealed. I guess I’m a little odd that way, but all of my Deadhead friends will tell you that I do this sort of thing incessantly. Eventually we near the end of Eyes, and something entirely wonderful takes form. Before getting to Drums, there is a winding down segment where the band slips into a Space which draws out pure ambient soundscapes for a number of minutes. This is absolutely gorgeous, and floods the crowd with a near silent transition into Drums filled with sonic washes and the ringing of old Tibetan singing bowls. It’s a magic transition from song into the drums/space portion of the show, not to be missed – something I can’t quite place having heard anywhere else. Then, as Space winds down, Jerry is playing soft flower petal breezes that seem to edge toward Attics Of My Life. Rather than forming into a song, the entire band simply tends to the moment itself, wanting for nothing. It’s like they are wrapped in their own satori moment. The band members, sound and road crew, instruments, cables, lights, dials, and speakers all bleed into one, mindless of the audience, though clearly allowing the conjured magic to spread off the stage in a fine mist. This could go on forever, and it displays again the highly personal nature of the music that has been played thus far. The band finds its way to Throwing Stones on lazy lapping waves of music. There are few times where I can pinpoint the band making such a sensationally liquid transition out of Space into a song – and that’s considering the fact that all Space ever did was transition liquidly into song. Beautifully, we emerge in Throwing Stones proper, and it’s a lovely version, again with nothing forced or hard edged. The song ends with a near whispered call and response between Bobby, the band, and the audience on the line “Ashes, ashes, all fall down” which trickles like dew drops into Other One. The transition is one made more of silence than of music. Very nicely done. Other One grows into a beautiful fountain of swirling beats and accents. Jerry gets that small step ahead of the music, bringing out that wonderful feeling of almost falling over as you run downhill, while the drummers seem to be drawing attention to every possible up and down beat. These things combine to elevate the music and display that the band is listening intently, and enjoying the moment. 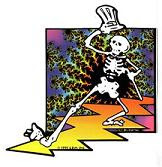 After a nice Wharf Rat the set ends with the pairing of Around & Around into Good Lovin’, bringing the crowd to its collective feet with jubilant dancing pleasure. With this particular source linked below you can hear how Charlie Miller had to use an alternate AUD to round out the last minute or so of Rango’s recording. Not that we needed reminding, but it is here where we can completely appreciate just how good Rango’s recording is. The second source is darn fine, but pales next to something such a cut above. Thanks, Rango! A number of years ago, David Gans interviewed me on his Grateful Dead Hour radio show, asking me to talk about audience tapes, and the Wall of Sound in particular. We played and talked about the Dillon Stadium 1974 AUD, one of my favorite tapes (just waiting in the wings for an upcoming review here). Well, my luck continues.. I figured that most of the GDLG readership would be interested in knowing that their trusty DeadListening tour guide, icepetal, is going to be featured on the radio this weekend. I was invited to appear on “Bring Out Your Dead,” the weekly Psychedelic/Dead-based 2 hour radio show that broadcasts on East Village Radio, a live 24/7 streaming radio station based in New York City. The show airs each week in the late night hours each Saturday (okay, very early Sunday morning) from 2AM – 4AM EST. And fear not, they also provide podcasts of all shows, so you can download, or even subscribe (as I do) via iTunes or your favorite player and listen whenever you want. You can check out the upcoming play list for this weekend’s show (September 20, 2008), and get set up for the podcast at the Bring Out Your Dead home page. The podcast will be available as quickly as 10 minutes after the show finishes up at 4AM, Sunday morning. I don’t know if it has something to do with the way I built my collection of Grateful Dead tapes, but I am endlessly impressed with how great the band was in the early 80’s. Of all the eras that I listen to, this one seems to be able to wow me more often than others after so many years of listening. I think it has something to do with the fact that I built up hundreds and hundreds of hours of tapes before ever going after shows from the 80’s at all. In some ways, that caused me to encounter the 80’s Dead as something of a new band when I finally took the plunge. I think it also has to do with the relative obscurity of the early 80’s Dead music. Not that the music can’t be found, but that there are very few dates that ring out as historic events from the 80’s, while the 70’s produced all kinds of classic dates (Europe ’72, Watkins Glen, Englishtown ’77, playing at the pyramids in Egypt in 1978, etc..). Someone not in our obsessive compulsive little world of collecting wouldn’t generally think of 1983 when they think of the Dead. They think 710 Haight Ashbury in the Summer of Love, or 70’s classic rock or something. In the 80’s there are all these amazing musical journeys quietly sitting in nondescript corners of nondescript years. Somehow, this makes the good stuff all the more satisfying to me, adding to the pleasure to be found there. My tape collecting started off with a focus on the early 70’s and 60’s. Early on, I met what for me became a natural road block with the 10/21/78 show. I was so underwhelmed by that tape that it soured me to anything from 1978 or after. 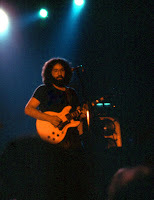 Also, I was finding it hard to fully fall in love with 1977 like every other Deadhead and their brother. Oh, I dappled into the 80’s (as I described in the 02/21-22/82 review – when I found Rango Keshavan’s webpage nothing stopped me from doing a four show trade for copies of his 82 masters), but for the most part my world centered around 1973 and the few years that circled it in each direction. When I did finally recognize that I must be missing something - from the high regard given the early 80’s by many folks in my trading circle - I force-fed my way into the decade. Trusting my trading partners’ recommendations, I probably gathered a dozen shows (20 plus tapes) or more within the span of a week, all from the period of ’81 to ’84 (I know coming into possession of a dozen shows over a week means nearly nothing now – we can download that in a day now. But it was a lot of deck spinning, bubble mailers, and trips to the post office back in the late 90’s) . Included in that first batch was 08/28/81, which, of them all, had the a most piercing impact on me, as did some 1984 shows. There was something about the actual sound of the band from this time period that oozed Grateful Dead-ness to me. I can’t really place why. It sounded very different from the 70’s (let alone the 60’s), but portrayed something that spoke the very language of the Dead all the same. Even now – in fact, maybe more so now that back when I was heavily collecting – I catch a special thrill off of really good early 80’s shows. Maybe it's because historically I don't expect these shows to impress me like, say, 1974. While the songs and power of Grateful Dead lyrics provided an unmistakable continuity between the decades, the Dead were absolutely an ever-changing band as each time period came and went. While it was not part of their own design, when the band was *on* in the 80’s, they sounded like a more mature, polished, and developed group of musicians than they ever did in the two previous decades. This is not to say that they were *better* in the early 80’s, which is why you didn’t catch me using that word. :-) It is more about how they seemed to have honed their craft in ways they hadn’t in earlier years. There might have been more fat to trim from show to show (although, one could argue that there was a ton of needless music played in the first sets from 1972 to 1974), but time and time again the early 80’s can reward even the most jaded fan. In the online Grateful Dead community, we have the ability to rub shoulders with young and old ‘heads alike. And it’s interesting to hear how a number of older heads tend to discredit much of what happened after the 1974 retirement, or perhaps post-1977. To many, shows in later years (i.e after 1974 and sometimes even earlier, as discussed in Primal Dead - The Early Years) completely paled to what came before. The Dead had sold out, given up, disappeared. 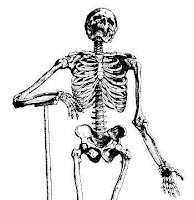 The disco Dead of the late 70’s were enough to cause some to consider walking out on the band. Strong sentiments, which somehow the passage of time brings into different perspective. For most folks, all eras of the Dead have something to offer, and it is hard to understand how some older fans could dismiss vast amounts of the archive – “after Pigpen, it was over!” . Personally, I can tell you that if it happened after 1984, I am hardly interested. And shows in the 90’s? It’s really hard for me to embrace them as I do the earlier decades. So I’m as jaded as the next guy. I often wonder if the late 80’s and 90’s are waiting out there for me to show up. Will I someday fall in love with the later years as I eventually did with the early 80’s? I guess the point is that it is worth allowing yourself to meander into as many corners of the Grateful Dead’s musical history as you can. There is always something special just around some corner. For me, the early 80’s have been an ever opening flower of delight that I found tucked in the back of a garden I once thought ended at 1979. 1979 often gets overlooked. It sits in the gargantuan shadow of 1977, and somewhere lost in the pre-dawn twilight of the early ‘80’s. This year might easily qualify as the very best year you fail to think of at all. And, failing to listen to what ’79 has to offer would be unfortunate; bordering on tragedy. It’s as if the entire year is hiding like so many individual shows lurking in so many years. 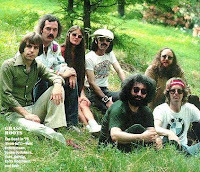 It was a transition year (the Godchauxs left the band, Brent Mydland joined in the Spring), and clearly a rejuvenating time for the group. By the end of the year, probably due to Brent’s infusion of musical craft and quickness to develop comfort with the band, the group was getting deeply into their own music; jammed out songs were getting a lot longer, and there was an obvious energy growing that shows the natural bridge from the ‘70’s to the ‘80’s. It’s really hard to find a bad show from late 1979, and most any night holds at least something spectacular, even if in only a song or two. This show on October 27th is a classic example of everything great that was happening toward the end of the year. Steve Rolfe’s AUD captures the magic energy beautifully on this night, and I recommend playing it loud. It lets more of the full spectrum (both sound and vibe) come off of the tape and allows it to fully pack its punch. While most of the highlights are in set two, it would be unfair not to mention the first set Big River. It’s good enough to make you always make sure to listen to Big Rivers in the future because of Jerry’s potential to really get off in the song. Also a nice early Lost Sailor > Saint of Circumstance is worth hearing. The song pairing was only two months old at the time. But it is in set two where things really come together. The set opens with a 14 minute Dancin’ In The Streets that lifts the crowd. The jam is tight, and the music swirls like a sea of city lights seen from above, dancing and weaving together. Bobby’s guitar cuts out momentarily deep in the jam, and this provides a cue for the band to let things loosen up some. The music starts to slip out nicely, eventually coiling around Phil to the delight of the crowd. From here the syncopated end section of the jam picks up, and the song is back on its tight track. A beautiful set opener, the energy is set for a real good time. The smooth as glass transition into Franklin’s Tower elevates things to an even higher level. Frankin’s was getting a major workout in the Fall and Winter of 1979 too. Here, a very typically long 17 minute version ignites the audience as a song that in four short years had already become an absolute classic. Now you can tell that the second set is touched with something special. The audience is fully engaged and loving it. As the solo sections build, the drummers punctuate the beat beautifully, clearly having one heck of a time leading the groove. 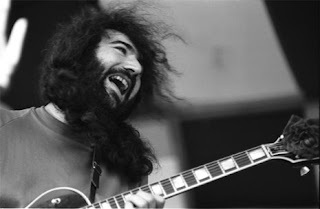 And this is not wasted on Garcia, who elevates his solos with them all the while. The song burns and burns, lavishly long. The solos become towering trumpets that howl at the sky, punctuated by the intimacy of Jerry’s voice in the verses. Now, with this 30 plus minute two song set opener over, the room is fully electrified. Almost seeming out of necessity, everyone gets a breather with He’s Gone. That often noticeable feeling of complete comfort and relaxation takes over as the crowd enjoys the presence of an old friend. But the cool thing about He’s Gone in 1979 is that it was also getting a workout, often finding the end jam portion evolving into a more intense exploration of music – often Caution-esque. And tonight is no exception. After the crooning vocal section of the song, the familiar sense of spinning, galaxy-huge, wagon wheels of light and color begin their slow turn across our entire visual field. Like waking up to a dream you’ve had before, this soft caressing turn of time, space, and music is a staple of the Dead experience. Here, things slowly weave to and fro, and before long the energy is picking up. The tempo increases, and the pace of Jerry’s lines quickens. Something is waking up underneath. It’s as if the heart rate and breath of the music are picking up speed. There’s also something a touch more sinister on the air. The jam catches fire and He’s Gone is left in the distance. We are now in a mostly free form improvisation that allows the band to stretch its legs. The Other One appears like a stalking beast, eyeing us through the bars of a cage throughout the end of the He’s Gone jam. The song’s theme slowly takes over and the monster is casting a dark hypotonic power into the emotions of the entire audience. When Phil crushes the entire building with the true opening line, the beast has broken free, and there is no place to run. Phil is so loud, it is a wonder that the entire sound system didn’t topple over. The raging monster is now more a sea of serpents coiling throughout the air of the hall. Useless to resist, surrender becomes the only option. The first verse comes and goes without a warning - you barely notice. It passes, and with it was your only chance to catch a breath. Phil attacks with the theme-roll again, and the world is cast into flame. The second verse comes, and directly after it nothing is the same. Space appears without transition from the verse. The band absolutely disappears completely into a formless charge of energy. It is as if we’ve been pushed through a membrane barrier, appearing in an entirely new world - like falling off the true edge of the flat earth into a unfathomable expanse of open space. It’s a humming, coursing, burning vacuum that extinguishes breath. The entire Space portion of music could be occuring between two heartbeats. There is no time here. No music. No escape. You can’t help but come out of it dumbfounded that this is happening in 1979. Drums slowly appears with Phil beating out the rhythm on his strings, setting sparks off with every stroke. The Drums is alight with a dark tribal energy, never really letting up. The Not Fade Away that finally forms comes stomping into the room – it too, alive with this dark energy. Eventually we get a really fine Black Peter to bring us back to some semblance of normalcy. But this show manages to leave its mark in the pit of your soul.